The two products above were synthesized using household bleach as the main reagent. The vial on the left contains benzoic acid, the product of a haloform reaction using acetophenone; this reaction normally requires halogenation using chlorine, bromine, or iodine in their elemental form. 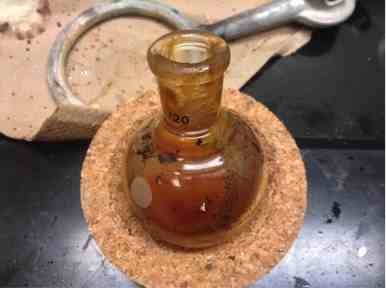 The use of bleach as the halogenating agent replaces the use of the hazardous elemental halogen reagents, making the reaction a plausible undergraduate experiment. Even so, the yields for this experiment are low, something we are trying to improve. The flask on the right contains cyclohexanone, the product of the oxidation of cyclohexanol. The oxidation of secondary alcohols to ketones is generally achieved using chromium-based reagents, which are highly-reactive and toxic. Using bleach as an oxidizing agent would allow these students to perform an important chemical transformation that they might not otherwise be exposed to. 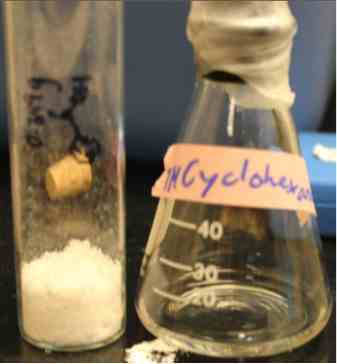 This experiment used baker’s yeast to reduce the ketone in ethyl acetoacetate to an alcohol. At Reed, we used sodium borohydride as a reducing agent, an inorganic chemical that must be handled with care due its high-reactivity. Although the above reaction proceeds slowly (it takes a few days to achieve high-yields), the waste generated is aqueous, and can be dumped down the drain after evaporation of any residual organic solvent. The first attempt at this experiment yielded a minute amount of product due to decomposition after distillation (the brown goop smelled like rancid teriyaki-sauce, and the distillate like rancid apple juice), a mistake I was not aware I made until Julia pointed it out to me. Cindy managed to salvage some product using a liquid-liquid extraction so we will try this experiment again using this method. The experiment, while slow, requires minimal preparation, and can be performed in tandem with another experiment, making its incorporation into any curriculum simple. 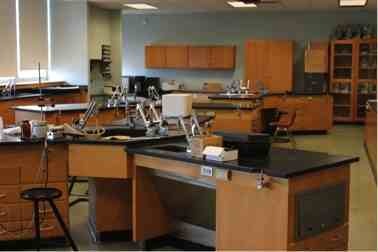 At first, my time in the lab was stressful (working in the lab from 9am-4pm takes its toll). I’ve always been nervous in the lab, but Julia and Cindy have made me feel at home here. The freedom they have given me in the lab has me daydreaming of experiments I want to perform, and new directions I want to pursue. I can feel the nerves being replaced with excitement. Learning about alternative synthetic routes that are environmentally-friendly and feasible in our modest high-school lab makes me smile like a fool. I cannot wait to hear about the green molecules Julia synthesized at Reed with Alan Shusterman, brainstorm about the things we can do at Bard, or ideas I can take back with me to Reed.